While all eyes are focused on Vienna and the OPEC+ meeting, inventory data will likely not be completely ignored following Tuesday's surprise API-reported crude build. 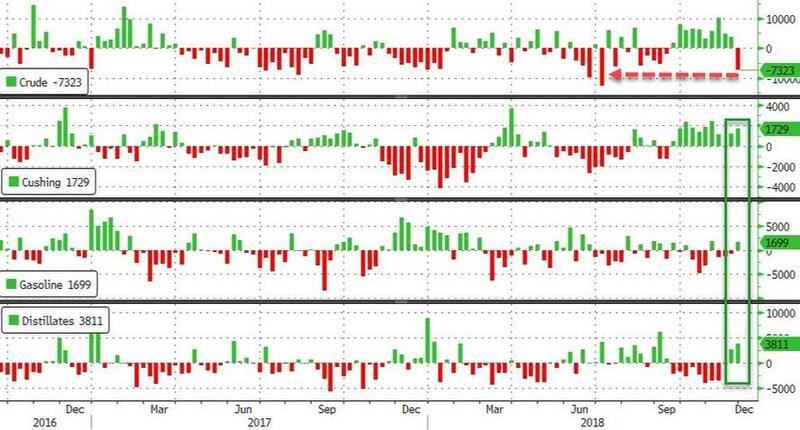 Most of the surprise crude draw came from the Gulf Coast - the biggest weekly decline in the region since December 2012. Oil production growth took a small breather last week after a magnitude 7 earthquake in Alaska struck on Friday, affecting oil producing and transportation assets in the region. Alyeska Pipeline Service shut the 800-mile Trans Alaska Pipeline System for seven hours while Hilcorp Energy temporarily shut some of its operations, which include oil platforms in Cook Inlet. OPEC won’t hold a press conference after its closed-door meeting ends Thursday in Vienna, a spokesman for the organization says. And WTI is holding its losses down over 4%.